So we’ve had a handful of “brisk” mornings here in San Antonio. And by “brisk,” I mean the temp has dropped below 70. Which must mean fall is here because I’ve seen a number of people out wearing sweatshirts. Or my blood is already starting to thin out some, because it’s really not that cool? While it may feel warm outside still, it’s starting to feel like fall as we head into October. And that means all things Pumpkin. At least to me. I love fall foods, comfort foods, tasty foods…morning, noon and night. I’ve been known to make a big pot of chili in the mid-morning and have a little for lunch, then let it simmer all afternoon and have it again for dinner. Ah….fall comfort foods! Anywho…I got to thinking about fall breakfasts last week and what kinds of “fall spins” I could put onto our favorite breakfasts. My Pumpkin Pie French Toast is wild-ly popular, and we love Pumpkin muffins and Pumpkin waffles. But what else…I took my favorite baked oatmeal recipe and made a few tweaks to it…mainly adding some flour to counter the moistness from the pumpkin and maple syrup. I wanted to use maple syrup for 2 reasons…add the flavor, and reduce the sugar content some (albeit, not much!). 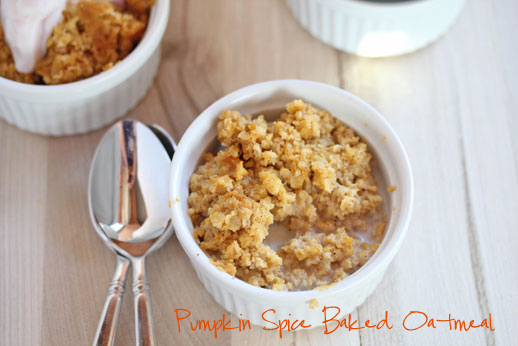 And voila, a delicious Pumpkin Spice Baked Oatmeal for ya! Note: This recipe only uses 1/2 of a 15 oz. can of pumpkin…so plan on doubling, or using the other half of the can in another pumpkin recipe. Baked oatmeal freezes well, just let it cool completely, cut into single serving sizes and freeze individual portions in plastic baggies. If I’d had pecans on hand, I would have chopped up 1/2 cup to 1 cup, and mixed into the batter. And I might try adding a few chocolate chips for a special treat next time I whip this up. Also, you could try making these in muffin form with the “second batch” for quick grab-n-go breakfasts! Gluten Free Version: Equal substitutions of all-purpose GF baking mix or brown rice flour for flour, certified GF quick cooking oats for quick cooking oats. Preheat oven to 350. Lightly grease a 9×13 inch baking dish with non-stick cooking spray. In a stand mixer or large mixing bowl, beat together the eggs, applesauce, oil, canned pumpkin, milk, syrup and brown sugar until smooth. Pour batter into the greased baking dish and bake in the preheated oven for 30-35 minutes, or until cooked through in the center of the dish. Let cool slightly before serving. Serve with milk, yogurt, Greek yogurt, or as is. Note: If you prefer it a little sweeter, add a little brown sugar or maple syrup. Enjoy! This recipe is featured on SouthernPlate.com’s Meal Plan Monday #35. This sounds great! It, we are still in the upper 70s here in Portland, OR, which is KILLING me because it feels too warm for October and I want some cool weather! haha. Hi – this looks delicious! I’m curious what type of oil is best for this recipe? Would butter or coconut oil work? Thanks! I used canola oil Ames…you could always experiment with butter or coconut oil! I love oatmeal especially with added ingredients. Thank you for this great recipe. I tried taking a look at your web site in my cellphone and the page layout does not seem to be correct. Might want to check it out on WAP as well as it seems most cellphone layouts are not really working with your web page. I am already craving fall comfort foods, so I had to try this recipe out! It turned out great! I did make a few substitutions to make them vegan. More applesauce to replace the eggs, almond milk to replace the dairy and then coconut oil is my preferred baking oil. They are delicious! I think I’m going to make these to bring along on our camping trips too. Thank you! Can regular flour be substituted for the wheat flour? How would you suggest subbing rolled oats? I don’t have any quick cook ones on hand! I made this for a bake sale at school. Everyone loved it, kids gobbled it up! I used coconut oil to make it again today. If you try this make sure to heat the milk before adding it to the mixture. I had mixed ingredients as they appeared in the recipe, then added the cold milk, the cold milk turned the oil back into a solid. I had to strain out some of the mix and warm it in the microwave and then mix it back in to melt the coconut oil. Make it easy on yourself and warm the milk before adding it to the mixtre.